SHARJAH, March 29, 2018: With the following words: “How will we approach communication going forward?” His Highness Sheikh Dr. Sultan bin Mohamed Al Qasimi, Supreme Council Member and Ruler of Sharjah, set the tone for the International Government Communication Forum (IGCF 2018), as he addressed an audience of over a thousand people at the opening ceremony of the Forum’s seventh edition today (Wednesday). Organised by the International Government Communication Centre (IGCC) at Expo Centre Sharjah, and themed ‘The Digital Millennium… Where to?’, the proceedings of the two-day Forum (March 28-29) will see the attendance of around 3,000 regional and international luminaries representing both the government and private sectors engaging in lively discussions on the rapidly transforming role of public and private entities in the new digital age. Over 40 speakers from 16 countries are participating in 11 discussion panels representing diverse themes like ‘Digital Diplomacy in Government Communication’, ‘Media Charisma’, ‘New Media in Serving Humanitarian Issues’, and ‘The Future of Communication’. A host of interactive speeches, workshops and training sessions in cooperation with media institutions and international organisations are also part of the Forum’s two-day itinerary. The Ruler of Sharjah continued: “Technology, if in the wrong hands, can be a dangerous weapon that has the power to turn people into mere puppets. We need to immunise ourselves not by shutting our doors to technology, but by building strong safeguards against misuse, and keep a watchful eye over our sons and daughters. Sheikh Sultan bin Ahmed Al Qasimi, Chairman of the Sharjah Media Council (SMC), took the discourse of communication and technology to a future time, underlining that children of today are dependent on us to shape the future of technology in ways that will make the world a better place for them. “As governments, what are we doing to accelerate this digital revolution in a way that benefits us, our people, the private sector and other stakeholders in society? Digital platforms have brought the government and the governed closer than ever before. They have equipped all actors in community with the ability to integrate their vision and goals, unify nation building efforts and work towards a global strategy of effective government communication characterised by closer public-private partnerships, transparency and better accountability,” he added. 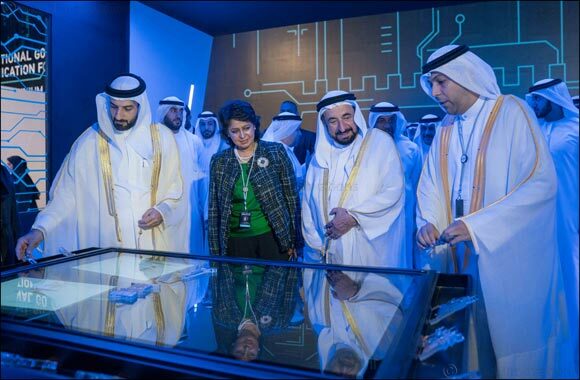 IGCF 2018 Guest of Honour, Dr Ameenah Gurib Fakim, expressed her appreciation to His Highness the Ruler of Sharjah for being invited to what has developed as a unique platform for global leaders to share their insights and build a common vision about the future of global government communication. “This Forum serves the great purpose of enabling governments to communicate more effectively with citizens and other stakeholders, and is an enduring legacy that leaders and other people under an oath of service to society can be proud of,” she emphasised. Gurib Fakim outlined the responsibilities of governments in communicating with citizens in three ways. First, they must be proactive in delivering comprehensive and credible information characterised by inclusiveness and other democratic processes. Second, they should provide the infrastructure and tools that enable the timely delivery of precise messages in case of national emergencies or natural disasters. Third, they must safeguard their people and their independence from hostile entities that try to access citizen data and exploit channels of communication for illegal acts. “If we don’t provide a reliable source of information to our people, the credibility gap will be immediately bridged by others from our countries and beyond, who will always have certain underlying agendas. We don’t have a choice but to provide a strong and integrated national communication infrastructure to ensure delivering communication messages that meet the needs and aspirations of the public, and at the same time comprise the necessary means of protection to ensure that information and data are not breached,” said Gurib Fakim. She pointed out that the ideal way to prevent manipulation is to further enhance transparency, and criminalise the abuse of personal data for commercial and political reasons. She underlined that the language of government communication must be transparent, deliberate, credible, understood, timely and managed by experts. She emphasised that messages will not be effective unless they build on previous successful, reliable and frequent messages, calling on governments, which are dedicated to protecting and enhancing the wellbeing of their people, to think of the manner in which they will use communication channels in the future. The opening session of the Forum, held in the presence of His Highness the Ruler of Sharjah, featured an expert panel comprising Sean Spicer, former White House Press Secretary, Naguib Sawiris, Egyptian media mogul who founded Orascom Telecom, and HE Mustapha El Khalfi, Minister Delegate and Official Spokesman of Government of Morocco. Moderated by Mohammed Khalaf, Director General of Sharjah Media Corporation, the session offered key insights on the issue of the gap between public and private sectors in approaching communication with the citizenry. HH the Ruler of Sharjah also listened to the five interactive speeches that followed. Tanmay Bakshi, the youngest Artificial Intelligence expert in the world and an IBM AI Champion, spoke about the challenges that face the field, as well as potential opportunities in AI as a key driver of the future of government communications. HE Noura Al Kaabi, UAE Minister for Culture and Knowledge Development, addressed the role of young leaders in governments of the future. Sir Timothy John Berners-Lee, inventor of the World Wide Web and Chairman of the Open Data Institute, explained why he has been promoting open government data globally and rights such as net neutrality, privacy and transparency of the Web. Khalifa Hassan Alshamsi, Chief Corporate Strategy and Governance Officer of Etisalat Group in the UAE, shed light on encouraging greater involvement of the communications sector in supporting future governments. Independent policy advisor and founder of the ‘Good Country Index’ and ‘Nation Brands Index’, Simon Anholt discussed the most optimal communication strategies and practices for good governance. His Highness the Ruler of Sharjah later toured the Forum venue, reviewing various activities and events being held as part of the 2-day communication summit. In keeping with its goals to pioneer best practices in government communications, the International Government Communication Forum 2018 (IGCF) focuses on the contemporary challenges of government communication in the region and rest of the world and explores solutions which can enhance communications in the future. In doing so, the IGCF will draw a roadmap to improve general communications for a better world in which all nations can enjoy social justice, equality, prosperity and progress. Through its wide array of panel discussions, the IGCF will explore how government communication can inspire a community through engagement and interaction and the roles and responsibilities of governments in the digital age. The ‘brand’ of a country could be hugely influenced by modern technology, which provides faster and more accessible communication with specific target groups. Each year, the Forum features more than 2,500 professional experts from around the world, including decision makers, officials, communication experts, government media personnel, civil society organisations and media professionals, as well as students of journalism and communication from all colleges and universities. The Forum addresses a diverse spectrum of issues and affairs dealing with government communication.